Hey, Inky Friends! So happy you are here to join me! 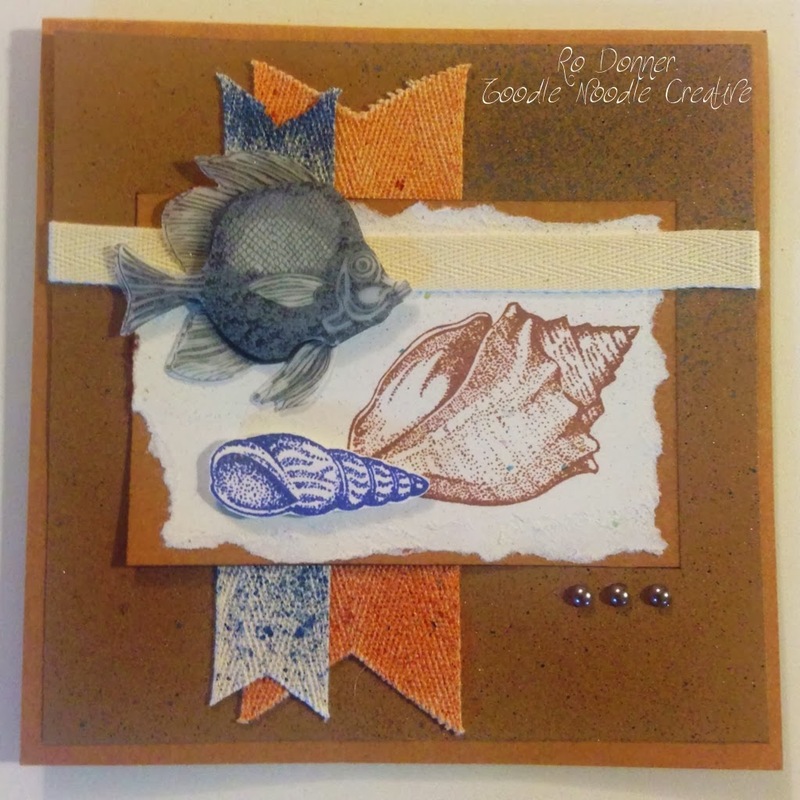 Today I am sharing an extremely quick and easy card using tone on tone. Actually, this blog post took me longer to write than it did to make this beautiful card! Using just two stamp sets, this card ended up being absolutely stunning. 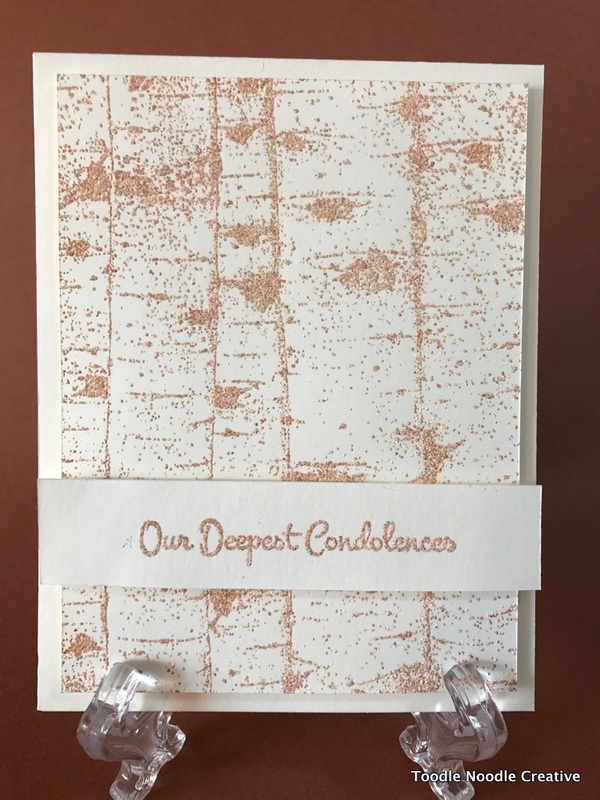 I first stamped the Birches stamp (Technique Junkies #S686) onto some ivory cardstock using Versamark and my MISTI. I heat embossed with some tan flecked embossing powder. I then cut the piece to 3 7/8" x 5 1/8". This background can be used for so many events. Dress it up for Christmas, darken it up for a scary Halloween background, or keep it simple like I did for this card. I cut another piece of ivory cardstock and, using Memento Ink (Toffee Crunch), stamped the inside sentiment from the With Sympathy Set (Technique Junkies #SS049). 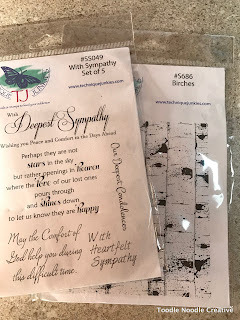 I have to say that this set has some of the most beautiful sentiments for bereavement cards. On another scrap of ivory cardstock, I stamped "Our Deepest Condolences" from the With Sympathy Set (Technique Junkies #SS049) using Versamark ink. 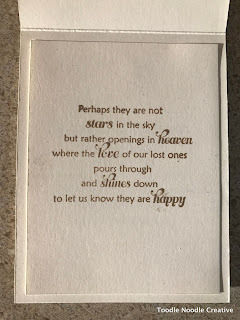 I heat embossed that with the tan embossing powder and cut it down to a banner 3/4" x 5 1/4". Using foam mounting tape, I adhered the background to an A2 card made from the same ivory cardstock. The sentiment banner was then foam taped onto the background. 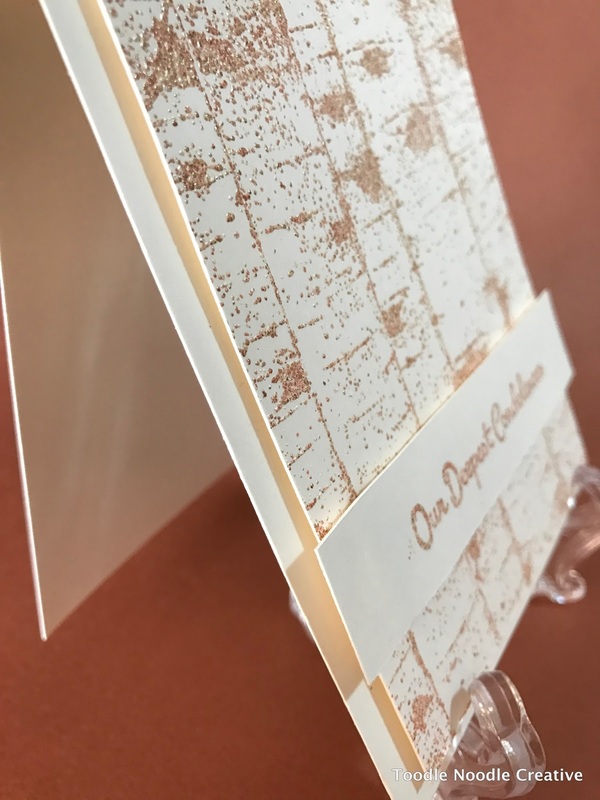 The inside sentiment panel was adhered to the inside of the card. Now this beautiful card will convey to someone how much we care about them and their loved ones. I hope I inspired you today. If you'd like to see more of what Technique Junkies has to offer, just visit THIS LINK! Last week I was busy moving my "studio" from one room in my house to another, little bigger, room. This is the third move for this crafting space. What started out as supplies shoved into a mobile cart many years ago, is now in what I hope to be a more permanent space. After my son and daughter-in-law moved next door, I claimed "dibs" on the space. I laid the floor (all by myself!) and, with hubby's help, installed counter tops and new power outlets. Just waiting for him to finish the electric hook-up. I moved all the furniture myself and got everything pretty much the way I want it. There are still a few straggling items in the old room I have to sort through and stow, but I'm so happy in my new space! I actually have space to spread out my vinyl projects now. And I have a lot of space to spread out making cards and other crafty projects. I thought you might enjoy a little tour of my studio. Well, that's my new little space! Would love to see your comments! So, I have been a little on the lurking side and not so much on the posting side lately when it comes to the blog world. Well, that is all about to change! I have been selected as the newest member of the Technique Junkies Design Team!!! Can I get a woot-woot?! I was fortunate enough to get to work with Pat Huntoon (the founder of Technique Junkies) at the recent Stamp & Scrap Show in Southfield, Michigan on October 1st and 2nd. I spent the weekend demoing in her booth and getting to know this very talented lady. If you aren't familiar with Technique Junkies, you really should check it out! 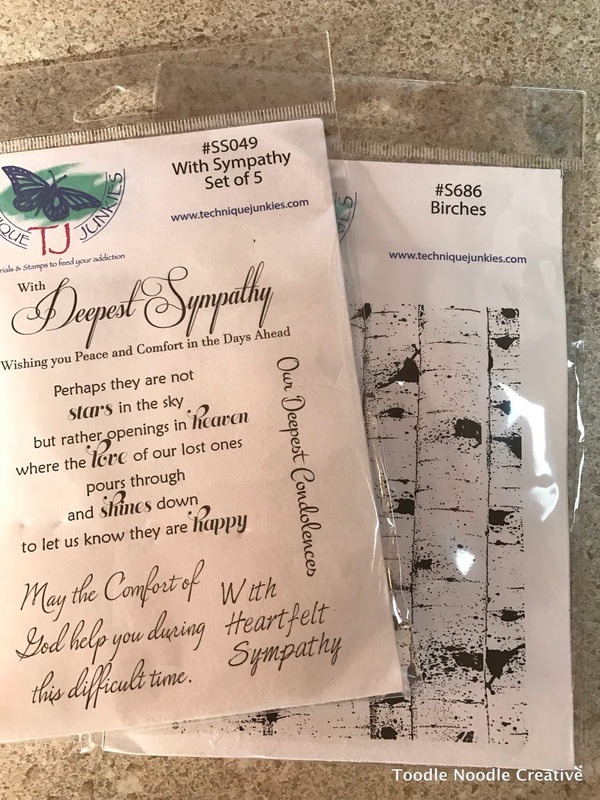 You will find lots of stamping techniques as well as a wide variety of stamps and products. I won't tell you how much I spent at the show...just know I came home with a LOT of new "stuff" which I will be happily using for my new projects. I can't wait to share with you! 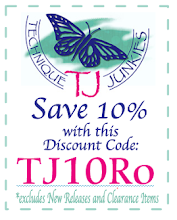 On that note, I am excited to share the Technique Junkies Newsletter. It features the project that I demo'd for Pat. Just click the link.